Some of the Choir preparing to sing outdoors at a wedding. at the Hilton Puckrup Hall Hotel, Tewkesbury, on 1st September. The couple then set off for a three month trip to Australia. ages with both male and female voices in perfect harmony. To listen to BBC Radio 5 Live interview with BBC TV commentator Steve Wilson. Ceremony concluded with the Choir singing Abide With Me. 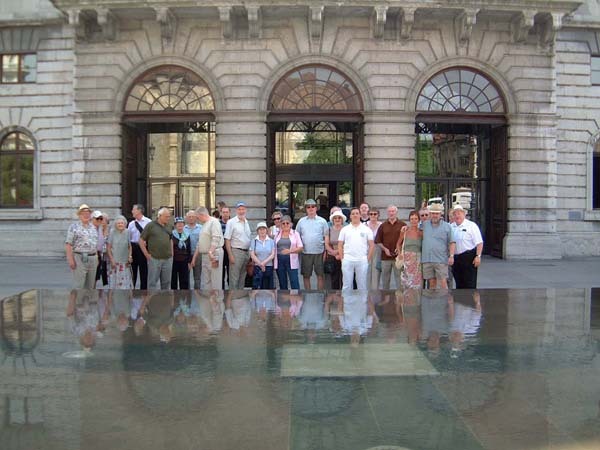 forthcoming Belgium tour including their invitation to sing at the Menin Gate, Ypres. 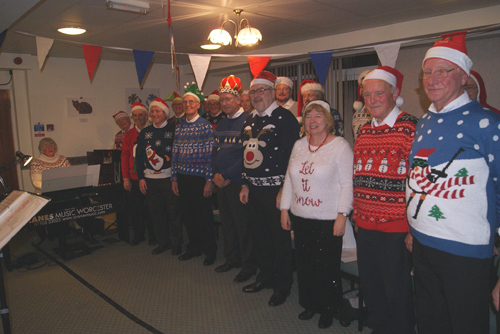 Each Christmas, the Choir entertains those in care at Nazareth House, Charlton Kings. On behalf of Winchcombe Rotary Club I'd like to thank you very much for the wonderful concert last Saturday which everyone enjoyed. I believe we raised just under a thousand pounds for the hospice which was a great result. Very best wishes and thanks to everyone involved. It was a very proud day for our bass singer Gordon Craig to be the Dad at his daughter’s wedding. The Choir were in full attendance and it was a great day. 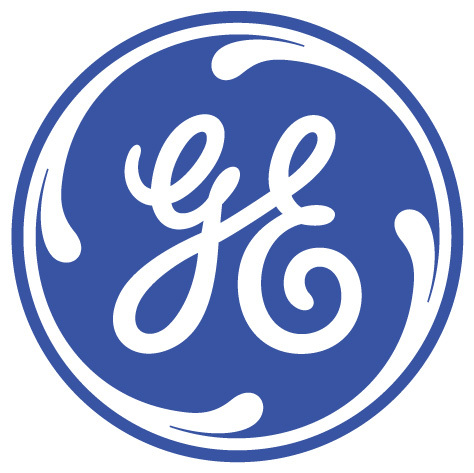 to stage a concert in Gloucester. your impromptu session. Thank you so much for a much appreciated performance. 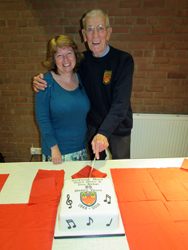 "Great night Saturday - I was almost moved to tears"
Aboard the ship "Kathleen and May"
Organiser and choir member Captain “Davey” Bainbridge. An excellent evening with a full house and an audience that really got involved with us. 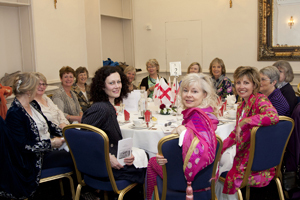 They waved flags, cheered and sang throughout the concert and made the evening a true success. There were many strands in making the concert the success it was, before, during and after the performance with everyone pulling together. 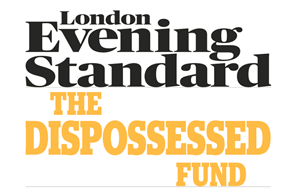 The props…well, they certainly lightened the mood!! Total ticket sales were 611 = £6,110. Congratulations on a fine, memorable performance on Saturday. A great team effort; I am so proud of you. Special thanks to our Frances for her unstinted work, to Richard B for the smooth-running compering and to Richard G who has lived and breathed the concert for many months. Good morning everyone, I am sitting here eating my toast and reflecting on the most incredible evening, at the Town Hall. I can't thank you all enough for the tremendous effort you put in, both in the months approaching the concert in terms of rehearsals and amazing ticket sales (Great job Steve Giles) and on the night itself, you should all be proud. Charmaine, Mike and Rob put in. Charmaine, once again you have pushed us hard and the results speak for themselves. Frances, as ever a superb performance. Thank you all once again. I was so proud last night of everyone involved and was, on more than one occasion, moved to tears by the passion and beauty of our singing and, of course by the singing of the MWC and the GE MVC. And..... we have had an approach from a chap who, having been so moved by our performance, has asked to join the choir! It was a full house! And I think it was the best concert I have been involved with in my 5 years of singing. It has been quite an extraordinary evening. Last night was as good, if not better, than any previous Concert I have sung in over the past 23 years at Cheltenham Town Hall, including the Life Guard and Flowers Band Concerts. An evening to be proud of. I thought that it was a fantastic concert and I’m sure that everyone who attended will endorse that view. Sorry I was absent. The reviews I have read are fantastic, as were the ticket sales. Really proud of you all. Thanks Charmaine, it was a magnificent occasion and a pleasure to be part of it. 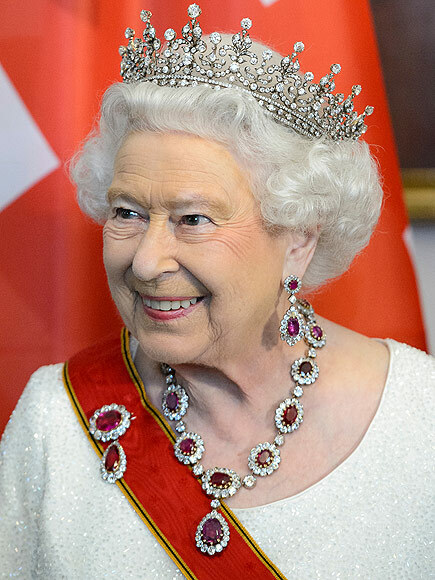 Congratulations to you and Frances for your skill and patience and such an amazing audience. I agree with everything said that it was a brilliant concert all round. Fabulous concert Cotswold MVC, Innsworth Military Wives & the newly formed choir GE Aviation MVC (brilliant after such s short time) raising money for Help for Heroes at the Town Hall. Well done all. I'm still on a high after our concert. Congratulations all round with a special mention of the fine performance of the new GE Aviation MVC achieved after such a short time. Great too to have been able to sing with the MWC - always a pleasure. Rosemary and my guests reckoned it to have been our best concert yet and remarked that we have come on in leaps and bounds (their words) under Charmaine's knitting needle - oops I mean baton!!!! As one of the new boys to the choir I would like to say what a privilege it was, and is to be involved with our great choir. Last evening was without doubt a great success and to see the Town Hall almost full to capacity was indeed highly rewarding. Quite apart from the choir having a terrific sound there is also an equally important aspect to praise and that is the wonderful camaraderie that exists amongst the choir. As the new boy on the block I am delighted to be involved and let us hope the choir can now only go from strength to strength. Rehearsal with the GE Aviation Choir in advance of the Help for Heroes concert. 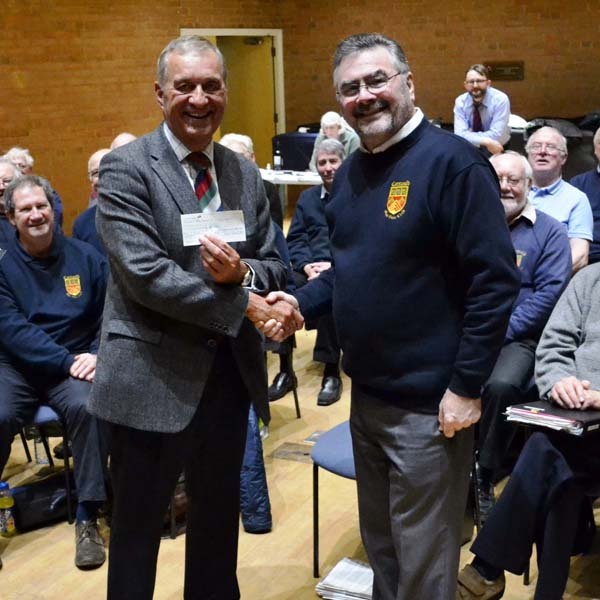 In attendance was choir Secretary Richard Gaul, who raised over £500. I just wanted to send a heartfelt and sincere THANK YOU to the choir for making our wedding day so very special. You really were a highlight of the day and the singing was even more beautiful than I could have imagined. Our guests loved it and it was a really special surprise for them. Thank you to you Charmaine especially for being so helpful along the way. some time, previously David had been a baritone stalwart for many years. Entertaining the crowd before the London Welsh match which Gloucester won 47 -10. We included Men of Gloucester in the programme, which the crowd really appreciated. Norman passed away at home on the night of 5th January 2015, having suffered a fall earlier that day. 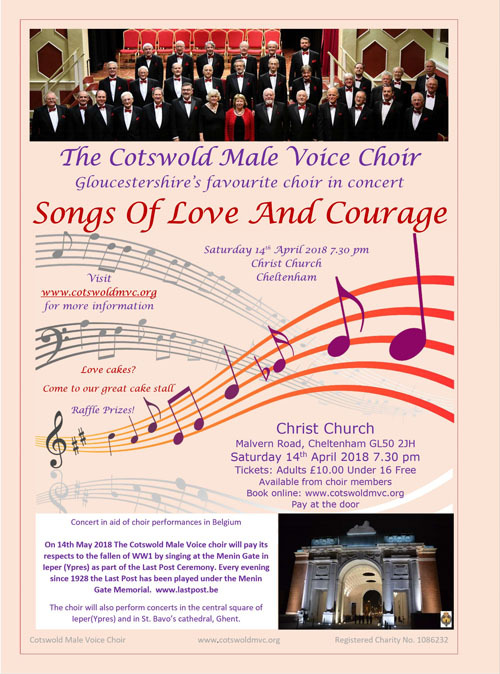 He sang for the Cotswold and Gloucestershire Police Male Voice Choirs for many years. Norman’s funeral was held at a packed St. John the Evangelist in Churchdown on Friday 13th February 2015. In attendance were 80+ male voice choir singers, representatives of the Burma Star Association, British Legion and Royal Engineers, accompanied by a congregation so large that some had to sit on prayer cushions in the aisles. The singing was really superb, several people wanted to clap after the Morte Cristie, including my grandson. I just held my sons hands (or rather squeezed them) throughout the singing of both pieces. Please thank the choir very much for turning out to celebrate Norman’s life, I am sure he would have been very very pleased. Bernard passed away at Astell House in Cheltenham, where he had resided for the past few years. He was a founder member of the Choir in 1949, ‘leading’ the second tenors for over 60 years. Bernie’s funeral was held at Cheltenham Crematorium on Thursday 15th January 2015. Former members of the Cotswold Male Voice Choir rejoined the current choir to give Bernie a rousing off. 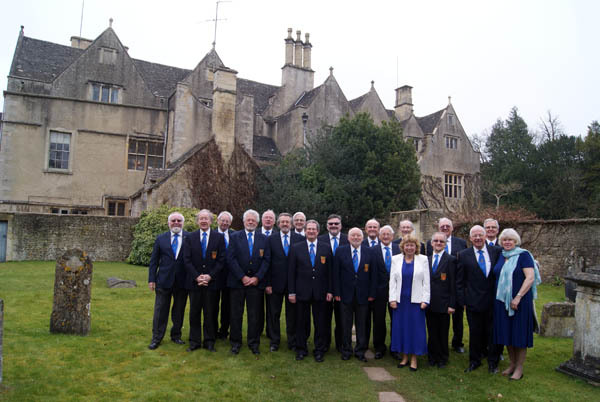 As part of an extensive three week tour including Dubai, Wales and Ireland, The Sydney Welsh Choir chose The Cotswold Male Voice Choir for a joint concert as part of the English leg of their tour. Bernie Campbell sings along to Martin Kay's Didgeridoo accompaniment after the concert. It's difficult to explain the hat ... so we won't even try! 4th August 2014 marked the 100th anniversary of the commencement of hostilities between Great Britain and Germany. Germany had already declared war on Russia. 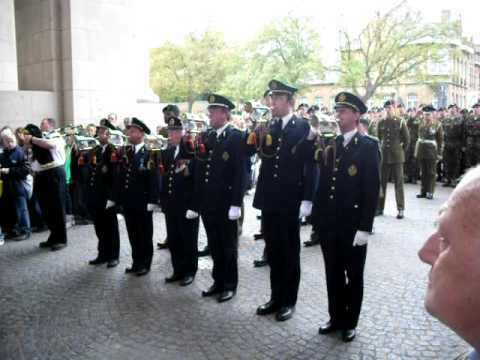 All the major powers of Europe mobilised beginning World War I.
with the Military Wives Choir. There are some concerts when everything clicks; choir, audience and atmosphere; and this was one of those nights. Perhaps it was the cause. We find most concerts supporting or commemorating our armed services are very sell supported. and who is still singing with the Choir (14th May 2014). Estimated proceeds from this St. George’s Day are £3,772, which is brilliant. Singing before the Aviva Premiership matches. 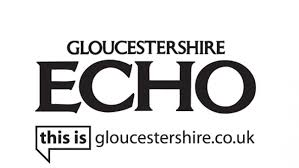 Following many requests, you can now download and print the words to Men of Gloucester. It is sung to the tune Men of Harlech which is said to have been based on an old Welsh air. It will come as a surprise to some that many sources claim the lyrics most familiar to us now were written by English composer Sir Joseph Barnby in C.19th. The Choir sings the version adapted for the film Zulu in 1964. It was with great sadness that we reported the death of our friend and colleague, Terry Hill, who died at 2pm on Saturday 25th January 2014 in Cheltenham General Hospital. 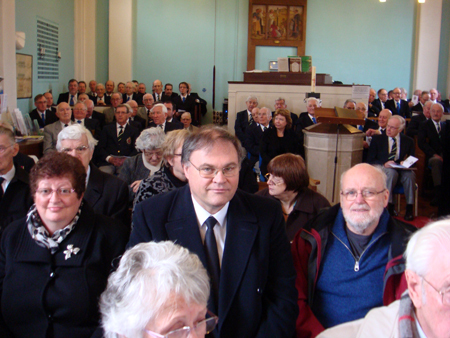 The photograph above shows Terry (right) following his last appearance with the Choir in Cheltenham Town Hall on 30th November 2013. Terry’s funeral was on Monday 17th February 2014, 1pm at Cheltenham Crematorium, South Chapel. 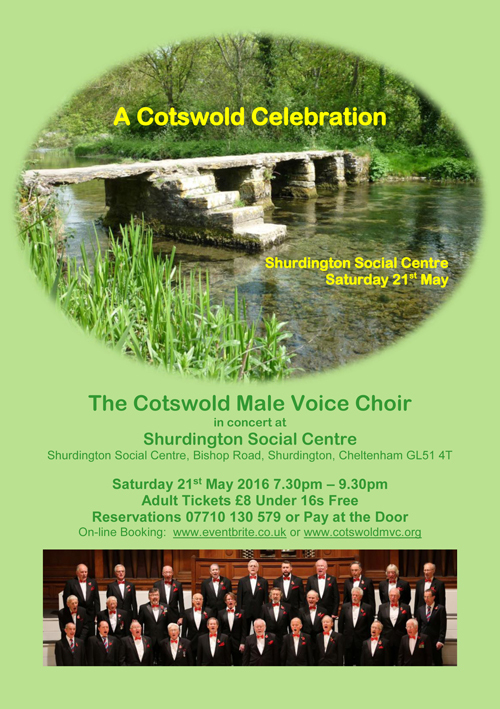 The Choir sang Terry’s requests Singing in the Rain (download PDF) and The Cotswold Song.